Imogen Cunningham was an American photographer whose intimate portraits and floral still lifes are characterized by their evocative light and attention to detail. “One must be able to gain an understanding at short notice and close range of the beauties of character, intellect, and spirit so as to be able to draw out the best qualities and make them show in the outer aspect of the sitter,” she said of portrait photography. Born on April 12, 1883 in Portland, OR, she moved to Seattle with her family at a young age. At 18, Cunningham began experimenting with photography after purchasing a 4x5 inch view camera from a mail order catalogue. In 1907, after receiving a degree in chemistry from the University of Washington, she traveled to Dresden to study fine art at the Technische Hochschule. After studying in Europe, the artist moved to San Francisco where she worked alongside Maynard Dixon, Dorothea Lange, and Edward Weston. It was in the presence of these artists that Cunningham explored new photographic methods, including double exposure and montage printing. 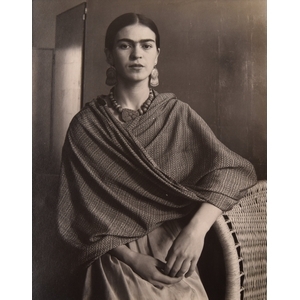 She would go on to have solo exhibitions at the Dallas Art Museum and The Museum of Modern Art in New York. The artist died in San Francisco, CA on June 23, 1976 at the age of 93. Today, Cunningham’s works are held in the National Gallery of Art in Washington, D.C., Philadelphia Museum of Art, and Tokyo Metropolitan Museum of Photography, among others.